1. When designing treatment plants for schools, kindergartens, cafes, restaurants and other objects for which cooking is foreseen, it is necessary to establish a grease trap, since in excess of the permissible concentration of fats (more than 50 mg/l) they form a film on bacteria of active sludge, which dramatically reduces the consumption of oxygen by bacteria, which causes them to die. 2. At the arrangement of treatment plants at such facilities it is necessary to provide separate sewage pits for household waste water from bathrooms and shower cabins, and waste water from sinks. 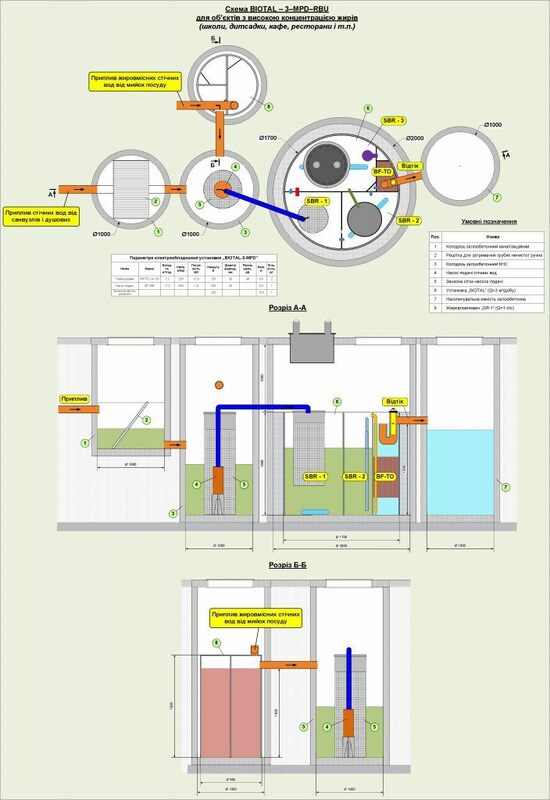 Sewage from the bathrooms and showers is fed directly to the BIOTAL plant, and the fugitive waste water from the sinks is initially pre-cleaned from the grease trap, and then mixed with sewage from the bathrooms and showers (see diagram). 3. There are two types of grease traps – internal and external. According to the requirements of DBNV2.5-64: 2012 “Internal water supply and sewerage system” for public catering establishments with less than 500 servings of hot dishes daily and for semi-finished enterprises it is allowed to install compact hermetic fat-separators with complete technological cycle and automatic control as close as possible to the places of formation of fats in a separate heated room in conditions of arrangement of necessary ventilation, supply of cold and hot water, the organization of fire extinguishing and other precautionary measures. From our experience in the operation of treatment plants, we recommend the installation of external grease traps, which work more efficiently, easier to maintain and do not create discomfort in the premises. Our enterprise manufactures grease traps in polypropylene case with capacity from 1 to 5 l/s, which are installed in standard ferro-concrete wells. To calculate the efficiency of the grease trap, the capacity of one sink (0.3 l/s) must be multiplied by the number of sinks. Dimensions of grease traps and their description are given in the relevant section of the web-site.